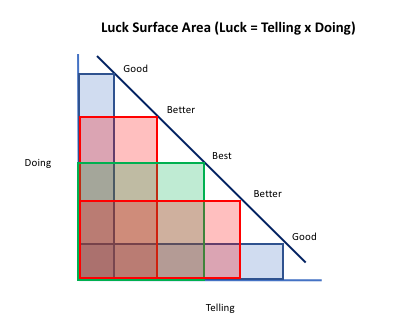 Jason Roberts 2010 "Luck Surface Area" model explains the need for entrepreneurs to combine time spent doing and developing expertise with time spent communicating with others. It's a very useful and actionable insight. Unfortunately, the diagram he chose to illustrate the model assumes that entrepreneurs have an unlimited amount of time to do both.